I was on a kick a couple months ago where I was just making whatever I could with coconut milk. One of the dishes I wanted to try was Chicken Curry. I've never had it before, so I honestly have nothing to compare it to, but I was very pleased with the final outcome. It was an easy meal to make because it's all cooked in one pot in a small amount of time. The chicken was very tender and spicy with just a hint of coconut. It's also a healthy dish that you can feel good about because it's loaded with lots of vegetables, uses light coconut milk and has very little fat. Sweet potatoes, red peppers and carrots are the main ingredients in this meal to add loads of nutrients while the more subtle ingredients add tiny bursts of flavor and color. 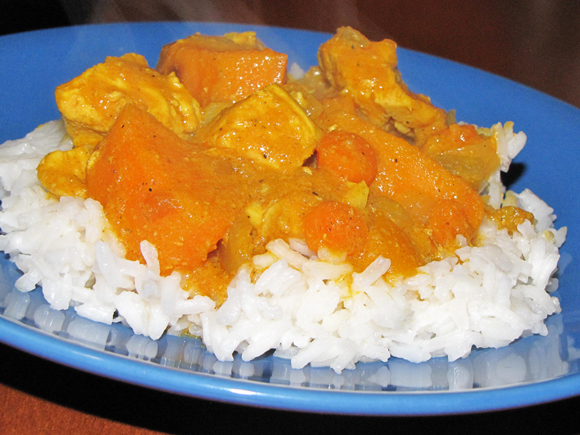 If you've ever wanted to try your own chicken curry, give this one a try. It's a good for you, clear-out-your-sinuses kind of dinner that will make your taste buds happy. 1. 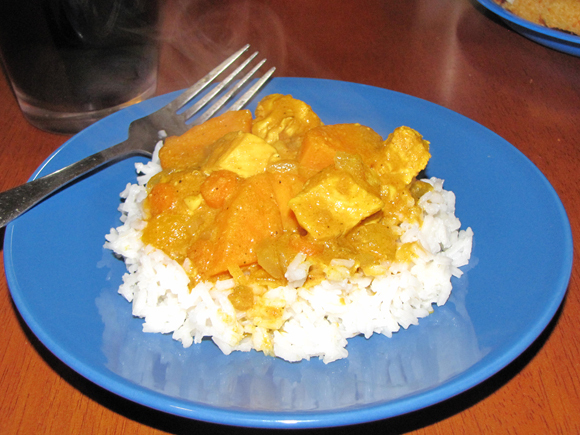 Cook curry in oil for about 3 minutes over med-low heat, stirring often. 3. Add red peppers and carrots to onion and cook for another 2 minutes, stirring often. 4. Add chicken and garlic and cook for about 2 to 3 minutes. Be careful not to burn the garlic. 5. Puree drained tomatoes with 1/4 tsp salt and add to pan. 6. Add remaining spices and mix well. 7. Shake or mix can of coconut milk until smooth and combined, then add to chicken mixture. 9. Stir well and bring to a boil. 10. Reduce heat to low, cover and cook until potatoes are tender and chicken is cooked through; about 20 minutes.